Critics have slammed the Duchess of Sussex for attempting to hold her husband's hand at a ceremony. But fans have defended Meghan Markle after she tried to touch Prince Harry at the Young Leaders Reception at Buckingham Palace. Although there is no recorded rule that the married couple can't hold hands or touch in public, body language guru Robin Kermode said Meghan's move went against Royal orthodoxy. Harry made it obvious in the video that he didn't want to be bothered with her. Besides, it does look unprofessional holding hands and touching unnecessarily when out on public duties. She acts like a teenager always wanting to touch him and in her mind, to prove to people that all is well with them. ^Good heavens these fans are clueless. It’s unprofessional. Period. Plus, it will come back to bite her when the marriage stabilizes so when they don’t cling it’ll be “Trouble In Paradise?” headlines when it’s just normal marital behavior. Or, they’ll blame the BRF for “stifling” her. She’s creating problems and drama unnecessarily. Oh please. THis is the 21st century not the Middle ages. She did this out of habit. IT is not going to change the fate of the Planet Earth. I don't know what Harry made obvious. NOw that they are married (and the wedding was not called off), they appear to be watched under a microscope hoping his "attitude" (never hers) has changed and they will break up. I doubt that will happen. She will learn. It's only been over a month now. As far as the money she allegedly spends. Charles not in a trillion years would spend megabucks in One Month after the marriage on his second daughter in law. She had her own money, got freebies and deep discounts as an actress. The DM can say anything they want because I doubt there will be any audits or financial disclosures on th Family. She did not dispose of the pre marital clothing, she kept it so the DM is busy researching the "book" price of the clothing and make up figures that she supposedly "spent". MOre click bait more revenue for DM. Yes Charles is tight and I don't think he bankrolled Murky before marriage, but Harry has his own millions he can spend as he wants to. It's not like Chucky is the only person Murky can mooch off, and Haz has demonstrated time and time again that he isn't the brightest bulb, just like his brother. Harry if he used his inheritance money from Diana is not spending "taxpayer" money. But she had her own wardrobe before the wedding. In the past royal brides have come with their own wardrobes from their country of origin (if they were from another kingdom). Since Harry may only have a small stipend from the military and never worked a day in his life, then all of it is funneled through the taxpayer. He pays no rent, utilities, personal protection or even pumps and pays for his own gasoline. To try and sell that Harry is an independent person who earned his own way is ludicrous. Even Diana’s money, if you backtrack far enough is courtesy of the taxpayer. She didn’t make millions as a teacher’s aid. So, these two should expect scrutiny and/or frustration re their expenditures. Prince Harry's appearance today comes after he thrilled sports fans at a charity match in Oxfordshire yesterday. Harry was seen squatting in his riding helmet following on from yesterday, when he made a surprise appearance at British Polo Day in Henley-on-Thames, Oxfordshire. Friday's event, which saw Prince Harry and the US-based Valiente team take on the UAE, raised £200,000 for the Royal Foundation and Sentebale, two charities of which he is patron. But it was Harry and Clarkin's team who triumphed and the pair were seen beaming as they posed for photos at the end of the match. Harry has a number of polo matches lined up this summer, giving Meghan plenty of opportunities to watch her husband in action. The newlyweds made their first appearance as a couple when they attended the Audi Polo Challenge at Coworth Park, Berkshire, in May last year. The event offered royal supporters one of the first glimpses of the now Duke and Duchess of Sussex together when they were spotted embracing in the car park. The outing, which saw the duchess being introduced to some of Harry's closest confidants, give yet another sign of the seriousness of their relationship. Just like last year when she got kicked out, she’s still in the parking lot this year. Celebrities call Splash photo agency when they want pr for themselves. Harry went to 2 polo matches without her so far, so she again looks like she showed up to this one unexpectedly. Splash only took pictures of her and other legitimate agencies took photos of Serena and her husband. This is a paid pap stroll because she called the photographer otherwise why wasn’t she photographed by the other photo agencies that were there? Splash is the go-to for celebrities wanting press. All the polo playing to raise money for charity whilst Meghan apparently spends thousands of pounds per outfit. Crazy. Diana's money came from the divorce settlement from Chuck, which came from his duchy, which belongs to the people. There are no known trustfunds or inheritance that Diana received. The commonly accepted knowledge is that all her millions and nearly all she had came from Chuck. All she had went largely onto her sons. Diana did come into an inheritance of her own at age 18 or 19 from an American ancestor. That's how she was able to buy the flat where she lived with the roommates. I think there must have been some bequests for her from John Spencer's estate. How William or Harry used the inheritance from Diana will probably be never revealed to the public. If Harry splashed 1 mil out of his own pocket on the fake wife he's winning the dumbest of the dumbest Oscar. I don't condone men spending on their women but clearly Meghan has serious lack in the decorum, style and taste departments and overcompensate with expensive stuff that doesn't look good on her. R&R, Dior and OdR already dissosiated themselves from her and that's post wedding..
^^ The flat was bought by Diana's mother (& possibly father, but Frances is always quoted as buyer) as 18th bday present and the rent she collected from her friends was way below market value and a pittance. 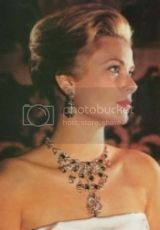 From her father she received a Cartier tank francaise gold watch. I can imagine that she inherited some things (amongst them money), but I strongly suspect nothing overly big or much, otherwise I expect it would have weasled its way into the public. I too, as pointed out by members here, find it interesting that this early on there's such a big campaign on M's wardrobe & spending. It constantly reminds me of the time when Chuck leaked via his friends Diana's cost and spending of her wardrobe, only it didn't work because she worked a lot and the public liked her. This is in any case a bit weird and seems like someone specific might be behind it. How's Tungsten weathering this, does she suspect backstabbers? Even in the form of her father-in-law, the family she "never had"? One of her American ancestor left a legacy to his descendants. Diana did get some money from that but I don't know the amount. She did not really have to work but she did anyway, taking two part time jobs at age 19. No way would Charles give newlywed daughter in law $$$ to buy an expensive wardrobe. Technically she did not "spend" one million dollars nor did her father in law. SHe had her own wardrobe and brought the clothing with her. I doubt she paid "book price" for the clothing--she probably got deep discounts and "freebies" during her career as an actress. The DM is "leaking" the alleged story. They just put the book prices of the clothing in and what MM actually paid is not known. DM is stirring the pot and using a lot of click bait lately. No way would Prince Charles pony up a million dollars for her clothing budget. No way. I'm not even Sure Chuck gave her the name Tungsten. IT sounds fictional. It also sounds out of character he would give her some weird name taking from a Van Der Post book or one of his gurus if he nicknames his daughters in law. And unlike Kate, Meghan worked for a living pre marriage and made money from her work in Suits. Very strange photos at the polo where Meghan had a fascination with the boot of the car. It looked like she was selling something. Maybe she is. Possibly yoga mats touched by MEggles magic feminist hands. The cost of copying the Duchess of Sussex's wardrobe is already estimated to cost $1 million (£760,000) according to The Sunday Times, and is likely to increase as her favourite designer, Givenchy launches its latest collection on Sunday. And while her bridal gown was eye-watering £200,000, even her more casual Givenchy pieces are an unattainable price with her dress worn to her first solo engagement with the Queen estimated at over £10,000. However, her fashion followers are yet to be deterred with fashion app Lyst, revealing that searches for Givenchy dresses are up by 110 per cent since the Duchess has made it her go-to label. There seems to ebe no real oucry from the people about this chick's expenditures. She's allowed to wear these outrageously expensive attire and Charles is ok with picking up the bill? It makes no sense. The more articles like this come out the more people should question how tho is being allowed and how exactly it's paid for. Comments about the clothes being on loan or pirchased at a discounts I believe a no-no's for the royal family. See, she can do whatever she wants and nothing happens to her. This is beyond nuts. Has anyone else ever wondered why they "need" such expensive clothing for what is mainly charity work? I more understand a higher amount for evenings, but for day to day "firm work". What for?!?! The truly wealthy (earned wealth) know it is wiser to live just below one's means. Mods, please move to the appropriate thread if this isn’t it. The Defence Secretary has been in a running battle with Downing Street and the Treasury as he demands an extra funding for the Ministry of Defence. MPs on the defence committee have said at least £2billion a year extra is needed. After being rebuffed by Prime Minister Theresa May - who challenged him to justify Britain remaining as a 'tier one' military power - Mr Williamson is said to have sought new ways to influence policy. Senior MOD sources told the Sunday Times the Queen was one of few people who could change the PM's mind - with Prince Charles and Prince Harry the best way to recruit the Monarch. MoD sources told the Sunday Times the royal family could be influential in the debate despite their need to remain politically neutral at all times. 'The strategy has to be to get to people who have access to the PM. Ask yourself who has access and influence. Her husband is one, the Queen would be another. 'I think you can get to the royal family through Prince Charles and you get to Harry too, who has recent frontline experience. Yeah, why not. Rules have been broken by the royals since Meghan came onto the scene that they’re now more celebrities than royals so them getting into political situations wouldn’t be an issue. Wills put himself into one vowing he wants to sort out peace in the Middle East. With William making promises he cannot keep and he is not supposed to be meddling in politics, the next two monarchs may be "meddlers."